According to Ayurveda, the world’s oldest system of Healing from India, by massaging every day with natural Apricot, Almond or Sesame Oils, baby is happier and circulation is stronger and healthier. 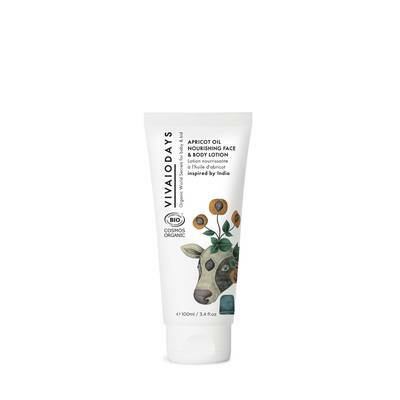 Ayurvedic inspired blend of organic oils & extracts creates a lightweight, nourishing texture ideal for delicate baby skin. Organic Apricot Kernel Oil helps maintain healthy moisture balance, combat rash & may soothe minor hypersensitive skin conditions such as eczema. Dermatologist-tested on sensitive skin. Gluten free. TEXTURE: Fast absorbing, non-greasy lotion. DIRECTIONS: Apply a small amount of lotion after bathing or anytime moisture is needed. Use it for face & body.